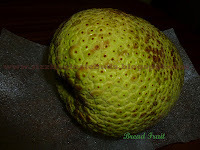 After preparing Bread Fruit Rava Tava Fry, I still had one more fruit lying in my refrigerator. So I planned to make these lovely Bread Fruit Pakoda's last Sunday for evening snacks. And what better way to have these fries with hot tea. Ingredients are very less and it tastes great but I prefer Bread Fruit Rava Tava Fry than this as it consumes less oil than these fries. 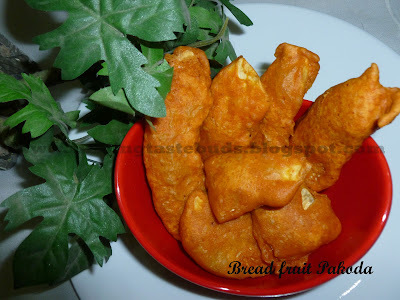 Here goes the recipe of Bread Fruit Pakoda's. 1. Peel the bread fruit and cut it as desired. Immerse the pieces in water to get rid of gums. 2. Make a thick paste of all the dry ingredients by adding enough water. 3. Heat oil and fry these bread fruit pieces by dipping them in the batter till golden brown. Also visit my site " Healing Plants"
A colleague recommended me to this site. Thanks for the details.